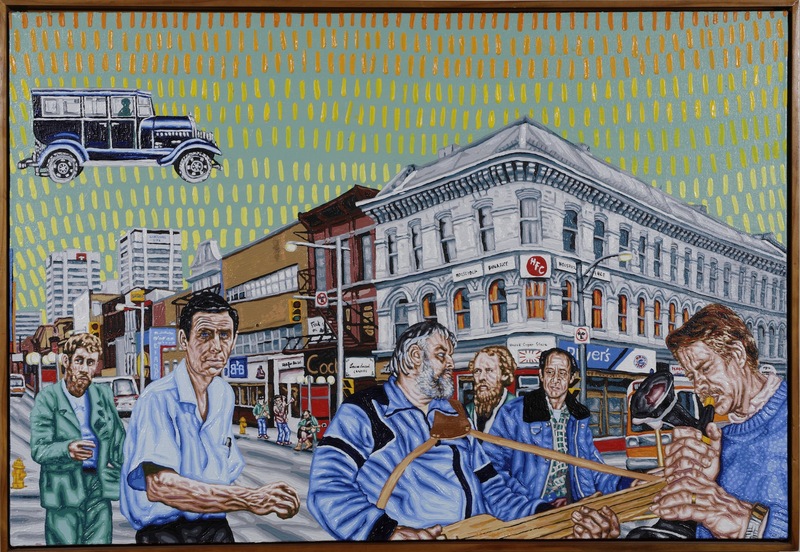 Set at the intersection of Dundas and Richmond Streets—not far from the York Hotel, where The Nihilism Spasm Band performed regularly beginning in the 1960s—this painting is a celebration of Regionalism and captures a snapshot of London’s vibrant social and cultural history. In the right foreground are Nihilist Spasm Band members Hugh McIntyre (with a homemade bass guitar), Murray Favro (not holding an instrument) and Greg Curnoe (with a homemade kazoo). In the background are band members John Clement, Boyle, and Art Pratten (seated). Founded in 1965, The Nihilism Spasm Band was originally a six-member band that revelled in improvisation and eschewed any recognizable musical style. Like the Nihilist Party of Canada founded two years earlier, the band rejected traditional structures and belief systems with a good dose of wit. Though its size has varied over the years, the band has shown remarkable longevity, surviving into the 21st century. Boyle also includes London artists Paul Peel and Jack Chambers (1st and 2nd from left, respectively) as well as London’s first mayor, Francis Evans Cornish (between McIntyre and Favro). In the upper left corner, Boyle makes a playful nod to another “London Six”—a London, Ontario-built automobile popular in the early 1920s. This anachronistic, commemorative approach to art is characteristic of Boyle’s oeuvre. Nellie McClung, Tom Thomson and Sir John Graves Simcoe are among those prominent Canadians who figure in his colourful works.